Michigan State basketball will travel to Nebraska Thursday night to take on the Cornhuskers and here’s what you need to know. Coming off a win over top rival Michigan, Michigan State has gained some confidence back following a three-game losing skid. The Spartans are now 13-9 on the season with a vaunted road game at Nebraska approaching Thursday night. No, Nebraska isn’t exactly the stiffest competition Michigan State will play all season, but the Cornhuskers have had the Spartans’ number in recent years and they just defeated Purdue. On top of that, Michigan State hasn’t played well on the road this season. Michigan State will look to overcome its road woes with a big victory in Lincoln on Thursday over the 10-11 Cornhuskers. Can they pull off a big win? Michigan State needs to find a way to get out to a nice lead early and keep its foot on the gas. The Spartans haven’t played very well on the road this season and the young guys are starting to gain some confidence back after a win over Michigan Sunday. If they can get out to a 5-10 point lead early on, they can extend that in the second half and avoid a letdown. Defensively, the Spartans need to defend the perimeter better, like they did against Michigan, and rebound. Allowing offensive rebounds has killed momentum in recent games and that can’t happen against a Nebraska team that doesn’t shoot particularly well. Second-chance points needs to be limited. Nebraska has had Michigan State’s number on the hardwood. The Cornhuskers have been able to pull off upsets over the Spartans in the past few seasons, but Tom Izzo admitted he’s aware of what they are capable of. 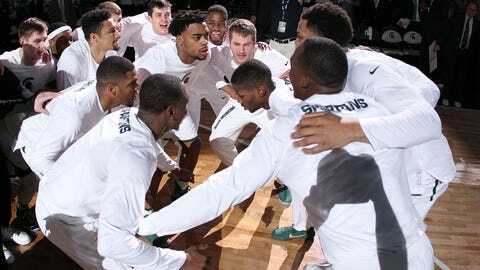 Expect the Spartans to come out hungry and string together a hot start with Miles Bridges, Nick Ward and even Eron Harris getting into the fun. Nebraska comes storming back late and this one goes down to the final seconds.